The end of the Civil War in Russia is usually dated to November - December 1920 and the evacuation of General Wrangel's Army from the Crimea. But Sovietisation of areas previously controlled by White forces or independent governments began before then and continued afterwards. The Baltics, Finland and Poland remained outside of Soviet rule but to the East, no part of former Imperial Russia was not Sovietised. 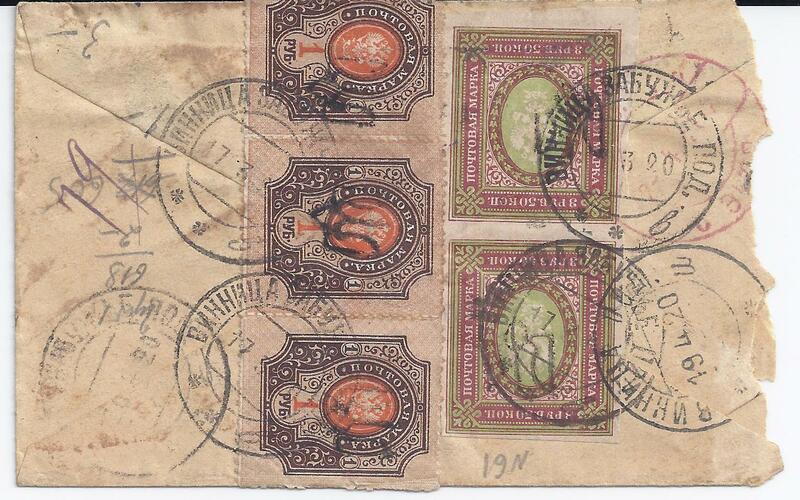 Indeed, some new areas were added if you count Mongolia and Tannu Tuva and the full absorption of Bukhara and Khiva. The period of Sovietisation and re-Sovietisation certainly lasts until the creation of the USSR at the beginning of 1924. The intervening years 1920 - 1923 are messy with national and regional differences in government persisting, sometimes reflecting greater or lesser willingness of local populations to accept Bolshevik rule and with it subordination of some kind to Moscow. In addition, economies had collapsed, people had starved, many had gone into exile. Here are two examples that I have recently acquired. 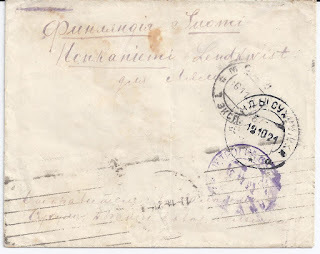 The second cover dates from much later in October 1921 and was sent from what I read as DRAND[a] SUKHUMSK O[blast] 19 10 21 in recently-Sovietised Georgia. 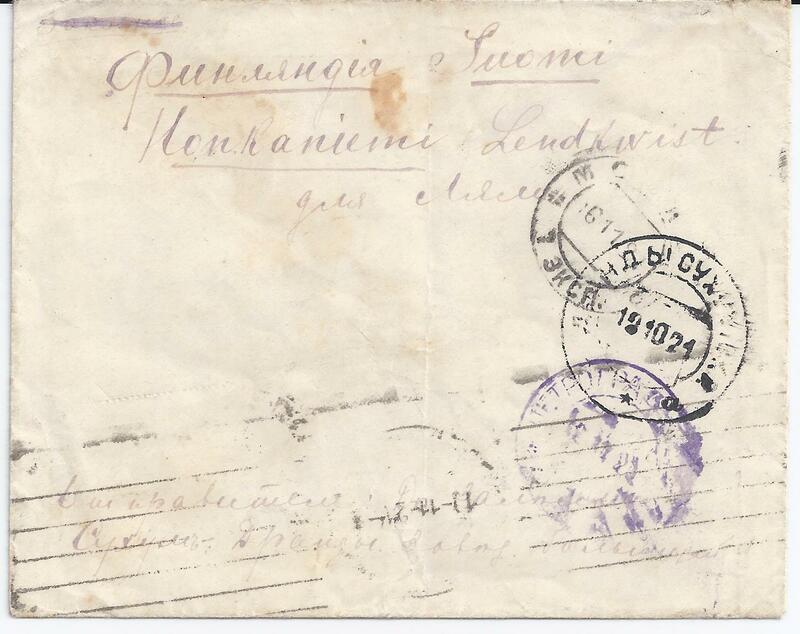 It is addressed to Finland with three HELSINKI HELSINGFORS cancels on the back but with unclear dates. 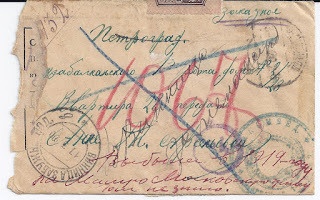 The letter transited through MOSKVA and PETROGRAD in November 1921 with a violet Three Triangle censor of PETROGRAD 12 11 21. 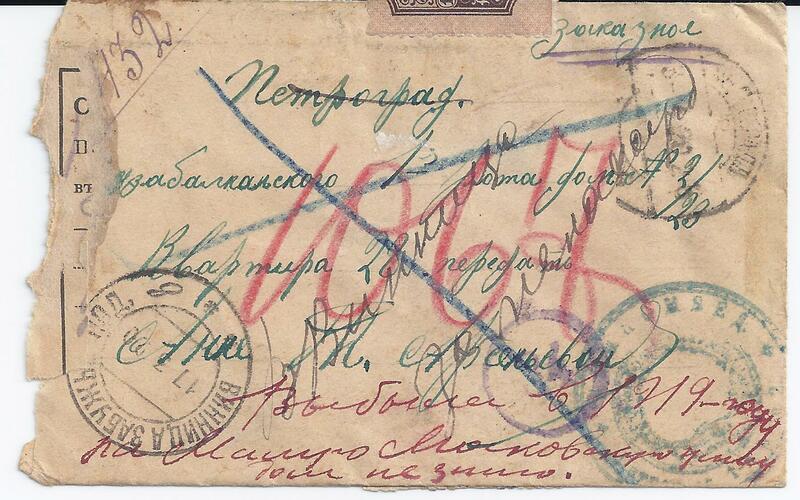 As I read the dates, it looks to me as if this cover was shuttled between Petrograd and Moscow before delivery. I cannot identify the roller cancel. What is most interesting is that the letter was paid in cash. 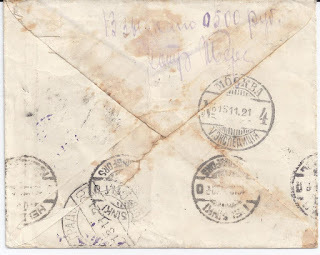 There is a Postmaster's endorsement on the back flap. It looks as if he first of all thought this was going to be a Registered letter at 1000 roubles and then had to correct the 1 to a zero when he realised it was an ordinary letter, thus yielding the odd-looking 0500 rub. 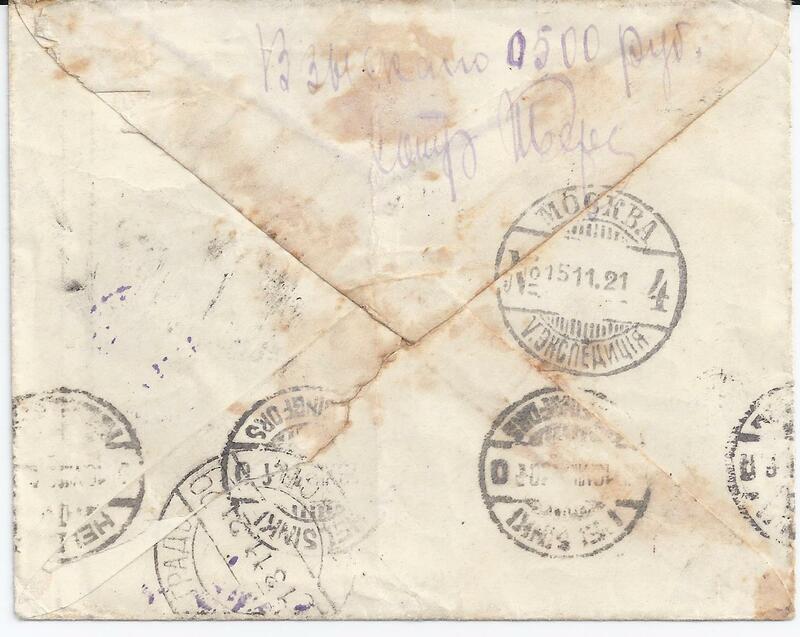 The word ZAKAZNOE [Registered] at top left on the front is indeed crossed out with the postmaster's violet ink pen. 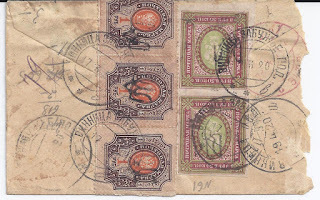 Neither 500 or 1000 corresponds to an RSFSR Tariff so I have to assume that this is a specifically Georgian Tariff. I await further clarification from readers.